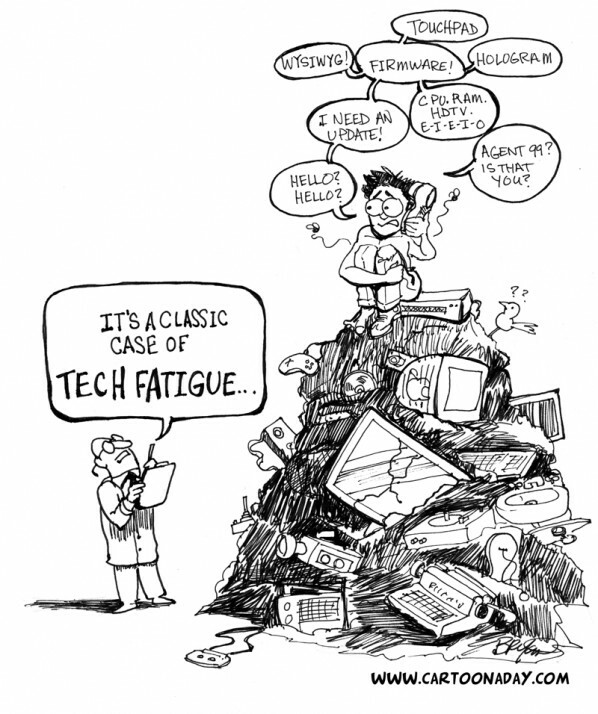 Here’s a new buzzword you may not have heard yet called ‘tech fatigue’. Tech fatigue is the overwhelming feeling of ‘meh’ with the addition of every new software update, iphone upgrade, bigger screen tv, you get the idea. How frustrating is it to plop down a couple hundred dollars for the latest and greatest thing, only to have it replaced by something cooler next week? Sure some of these new gadgets actually enrich our live a bit, but at some point it’s just too much. Why must our telephones have video recording and thousands of apps we never fully understand? I’m a techie at heart, but even the new ipad has me scratching my head. Anyhow, I hope you’re not one of the millions suffering tech fatigue, and if you are, I feel for you. Describe how tech fatigue can drive a person a bit crazy, and show the source of the fatigue and feelings of 'meh'.